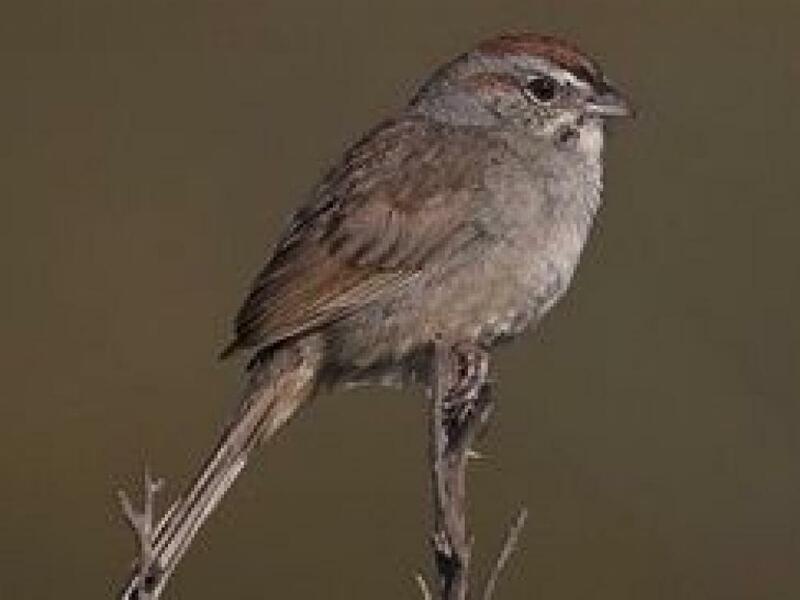 The rufous-crowned sparrow is more likely seen in Tarrant County and farther west according to NCTexasBirds.com. Photo courtesy of Christopher L. Wood/Cornell Lab of Ornithology. We like our birds like we like our jewels: large, colorful and flashy. Blue jays and cardinals catch your attention; woodpeckers make you say “wow.” To see a painted bunting is to score the avian rainbow. But close your eyes and it’s the melodious trill of sparrows you hear, punctuated by the sharp calls of their petite compatriots: chickadees, titmouses, thrushes and wrens. These and other tiny ones are lumped together as LBBs—Little Brown Birds—even though chickadees, titmouses and brethren like dark-eyed juncos are shades of grey. The females of several colorful species like red-winged blackbird and house finch are small brownish birds. Pity the poor sparrow, diminished by the invasive reputation of the chunky house sparrow, Passer domesticus. 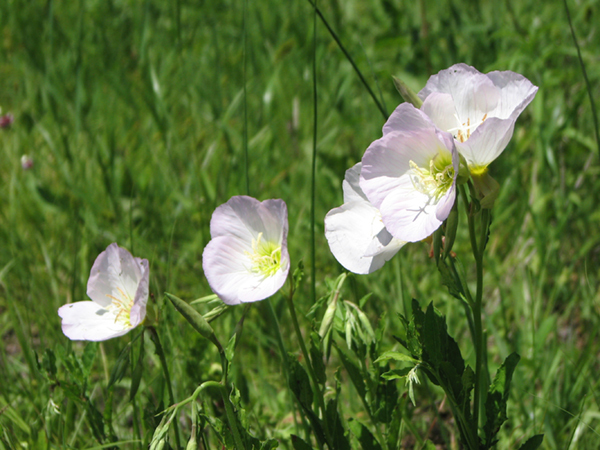 Imported from Europe centuries ago, it flourishes in urban areas and outcompetes native species. 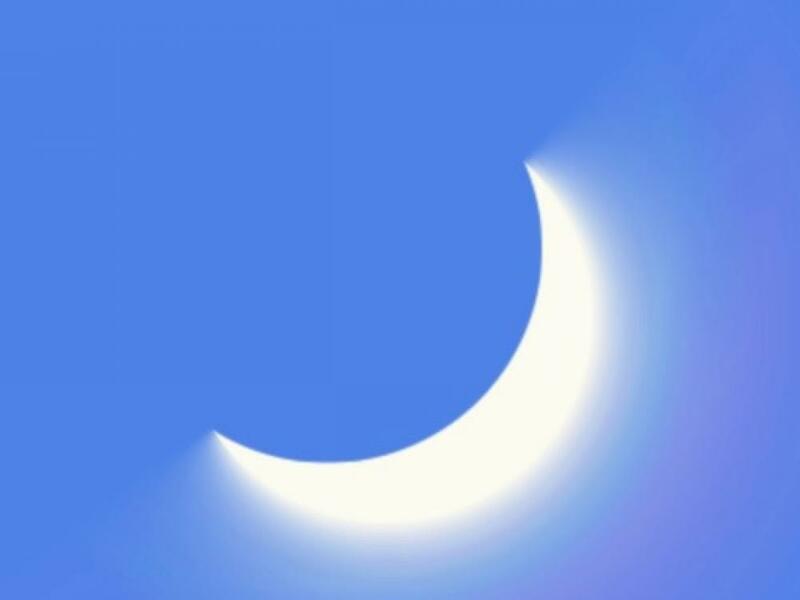 Though its song can be lovely, it’s usually just noisy. It thrives on the millet that dominates cheaper birdseed blends, so it’s always well fed. And such a messy eater at feeders! 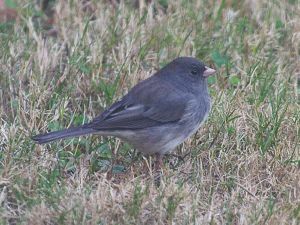 Dark-eyed junco in Carrollton. Photo by Chris Jackson, DFW Urban Wildlife. In dismissing the house sparrow, we pass over the native sparrows and their tiny earth-toned friends. Many LBBs are quite striking when you take the time to look. Winter migration brings a whole new population. Liven up the winter months by setting up a feeder by the window and getting to know your LBBs. Choose quality blends with lots of sunflower and safflower and high-protein blends like suet-peanut often found in blocks. Who you are we scant ask why. But who you are we often get wrong. No need to be an obsessive birder and get all nerdy about their species names, though that can be much fun. First allow yourself to simply admire the LBBs’ tiny wing stripes, natty head markings and proud chest badges. Look for the wing stripes and edging on the feathers and the color of the tail. What color are the beak and legs? Note if it has a ring around the eye and the pattern of head stripes. Perhaps it possesses a bold splotch of color on the chest. To study sparrows is to become aware of nature’s eye for detail, such as the muscular beauty and fantastic heads of the white-crowned and rufous-crowned sparrows. Or consider the Harris sparrow, a Canadian resident and North Texas winter visitor. Bulked up like a body builder, round rather than slender, it has a surprisingly long tail. The male boasts a broad black band going from a triangle on the chest, up its face and down the neck, giving it a fierce stern look accented with an incongruous pink bill, while the female has a friendly tan head. 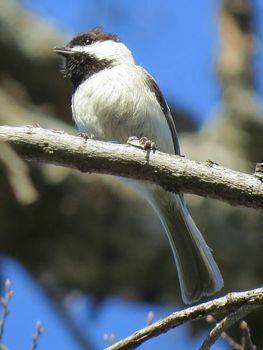 The Carolina chickadee has a distinctive call. Photo by Chris Jackson, DFW Urban Wildlife. Becoming aware of these subtle and varied differences may tap into our skill, formed as babies, in human facial recognition. Since humans are visually dominant with a muted sense of smell, it was how we identified our family and tribe. It’s the thrill that birders feel, that deep “aha!” when they recognize a friend, albeit a feathered one. To truly appreciate the sparrow, take a rural prairie walk via local Native Prairies Association of Texas Dallas and Fort Worth chapters and discover its beating heart — the slight and narrow, even elegant, field sparrow. Marvel at the savannah sparrow, with its breast stripes as fashionable as a three-piece suit and striking yellow eye markings. Melodic flocks rise from the grasses like a multitude of feathered blessings, sharp white outer tail feathers glinting in the sunlight, announcing that all is well in their prairie Eden. 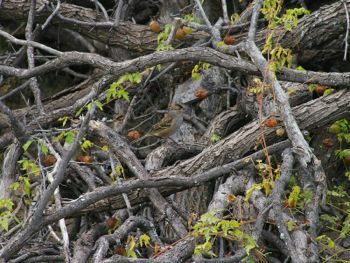 Can you spot the white-crowned sparrow in this brushpile in The Colony? Photo by Chris Jackson, DFW Urban Wildlife. 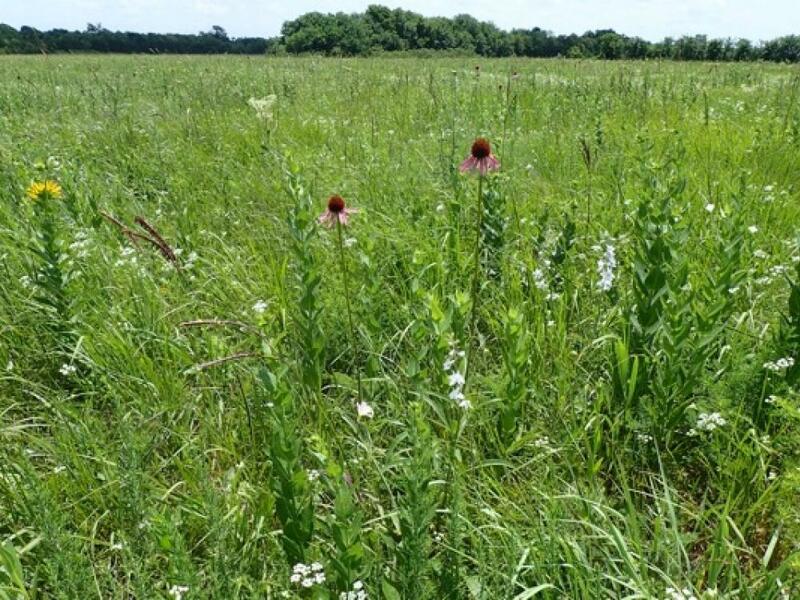 Get to know LBBs and more by visiting the local Audubon Centers: Trinity River and Dogwood Canyon. Take an hour drive and enjoy the incredible winter bird life at Hagerman National Wildlife Preserve. All these places present regular bird talks and walks. North Texas Wild is a monthly column exploring the wild spaces and wildlife in and around North Texas.